A protect the most powerful people from harm. B keep order throughout society. C limit the kinds of animals that were killed. Which is a belief of monotheistic religions? A There is only one God. B There are spirits in nature. C There are many gods. Which is a polytheistic religion? B have a caste system. A Muslims believe in one God. B Muslims worship in a holy place. C Muslims fast during Ramadan. Which religion is correctly paired with its founder? A sacred scriptures in Buddhism and Hinduism. B histories that explain the beginning of Hinduism and Judaism. C guides for proper moral behavior of Jews, Christians, and Buddhists. What is the common name for these sayings? According to this chart, which of the 5 major world religions was the largest in 2001? 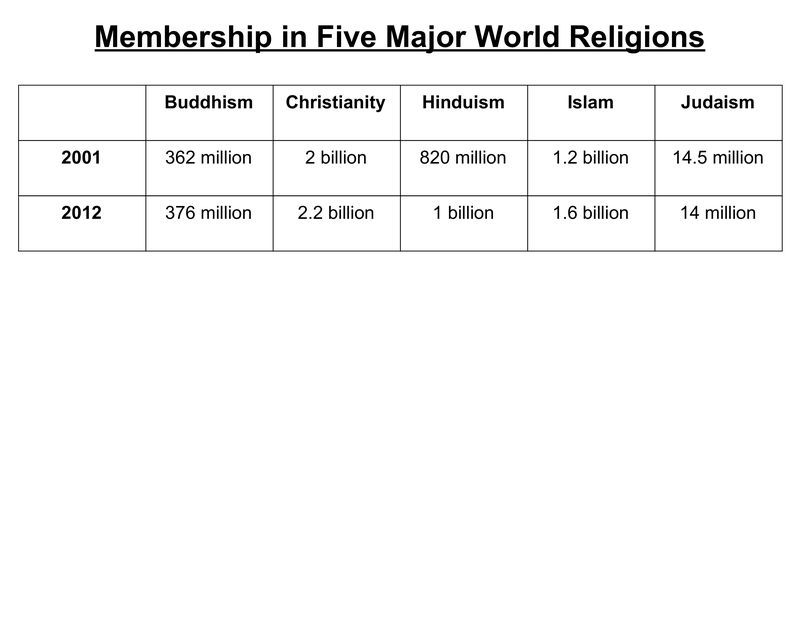 According to this chart, which of the 5 major world religions was the largest in 2012? Which of the religions shown on the chart actually grew the most between 2001 and 2012? According to this chart, which religion actually decreased in size?